Larry Gonzales is the new State Representative for Texas house District 52, beating out Democratic incumbent Diana Maldonado. Larry Gonzales has dedicated his entire professional career to making Texas a better place to live, work and raise a family. A strong conservative, his extensive legislative experience and knowledge of the issues facing our state will make him an effective leader for the citizens of Williamson County. 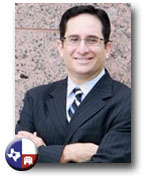 Gonzales is a 14-year resident of HD 52 and a seasoned veteran of the Texas Legislature, having worked nine regular legislative sessions including senior staff appointments for members of the House, the Lt. Governor and Attorney General. Most recently Gonzales served as Assistant Vice Chancellor for Governmental Relations for the Texas State University System (TSUS) as a liaison to the Texas Legislature and other state agencies for the TSUS Board of Regents, the System and its eight component institutions. In addition, Gonzales is the owner of a graphic design and communications company which offers a wide range of services including creative design and mediation. Larry is a 1993 graduate of the University of Texas at Austin with a B.A. in Government and has completed 30 hours towards his Master’s in Public Administration (MPA) at Texas State University and hopes to finish his coursework by 2011. Larry is active in the Round Rock Chamber of Commerce (member of the Government Affairs Committee) and is a certified mediator. Larry was raised in Alvin, Texas, where his parents have served as pastors for over 25 years and as Chaplains for the Alvin Police Department for 6 years. He and his wife of 15 years, Marie, herself a 1990 graduate of Round Rock High School, have resided together in Round Rock since 1996, where she is employed by the RRISD serving as Department Chair of Special Education at McNeil High School. Their two young children, ages 10 and 8, are enrolled in the RRISD. HD 52 is contained completely within Williamson County and includes large portions of Round Rock and Georgetown, the cities of Hutto, Taylor, and Thrall, and the communities of Anderson Mill, Jollyville and Brushy Creek. A small portion of Austin is also in the district.